And thus we arrived in Muscat; the capital of Oman, with approx. 1.5 mln inhabitants. 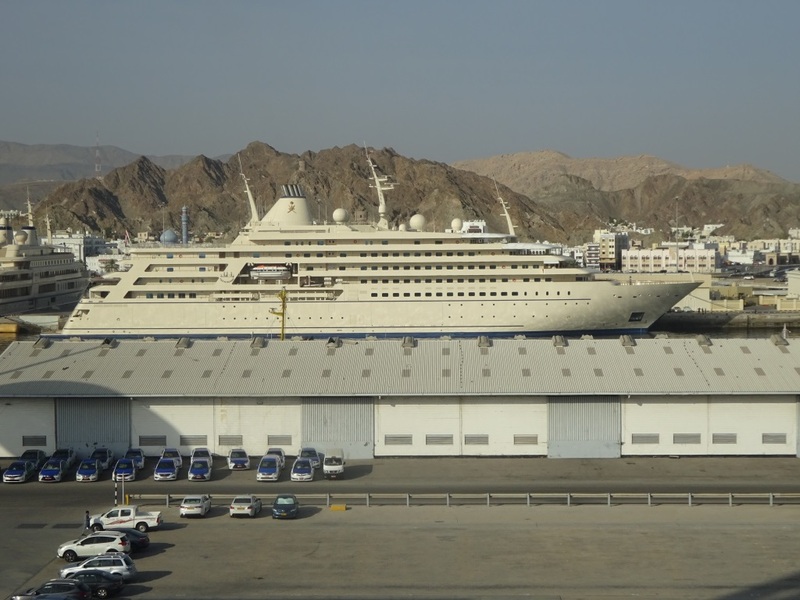 The port is called the Sultan Qaboos port and is not very large. Looking at the activity it is mainly used for ships bringing goods in and thus the cruise terminal doubles up as a container dock. Two piers are fully taken over by the Sultan’s private yacht and a secondary yacht which is used for his guests. Then to these two ships belongs a dedicated navy ship to keep the Sultan (full name Sultan Qaboos Said al Said) safe. The navy ship was nowhere in sight so I assume the sultan is not planning to go sailing in the very near future. The Yacht of the Sultan. The “Al Said”. and it is not even the biggest one in the world. The yacht, although it is more like a ship, is called Al Said after the family name and was built in 2006. It has a volume of nearly 16,000 tons which makes it 2/5 of the size of the Seabourn Ovation but that is only because is the less wide and less long, as it has almost the same height. I never entertained the idea of having my own boat or yacht as it is as if you are married to two women at the same time. Very expensive. With the yacht having the worst mother-in-law called “maintenance at sea”, but if I had the Sheiks bank account, I could settle for this. More than enough room to store all my books and memorabilia and with room left for a home cinema to please my Lord and Master. What do we do in Muscat; Tours and or visiting the City. Some of our guests conduct their private tours which is not a bad idea as you can deviate freely and also the drivers sometimes come up with suggestions to visit hidden gems far away from main stream tourism. For those who do not want to spend money on private transport, there is a hop on hop on bus in Muscat, which offers a 2 hour tour through the city. For those who prefer more structure, there are the ships tours. Visit the Sultan Qaboos Grand Mosque which is a modern mosque and a highlight in modern mosque building and attracts visitors from all over the world. It is open to non-Muslims as long as one follows the dress code. Then there is the ubiquitous city tour of 4 hrs. but one can also do the full day tour which takes everybody into the desert and to the strongholds of medieval times. I remember Muscat most vividly from a world cruise with the old ss Rotterdam (V). Then it was standard to have a number of costumed balls during the cruise either inspired by color combinations (red/gold, black/white, green/gold etc.) or themed to the location. Thus the office had dreamed up that after Muscat we would have an Arabian Night. Some guests brought costumes from home with them but most went ashore to buy something local. Much to the great delight of the local shop owners in the souk who were ever so eager to sell an authentic local costume. And most costumes were indeed made authentic after the shop owner had carefully removed the label: Made in China. I was on board as a spouse, as my wife was the world cruise hostess, so I had gotten it into my brain to get one of those black lady dresses including face covering. The idea was, during the ball to stand demurely on the side and wait until an eager gentleman would invite me for a dance……… always good for a laugh,at least that was the idea. To my utter disappointment there was a complete refusal of all shop owners to sell a woman’s dress to a man……………… even if it had been made in China. It did not work out whatever I tried. But the full day tour was of great interest as I love castles and forts, even if the noon time temperature resembles a barbecue. 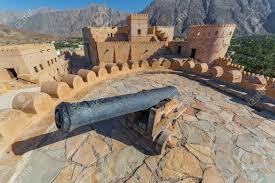 Nakhal Fortress, a stronghold dating back to medieval times is very impressive. 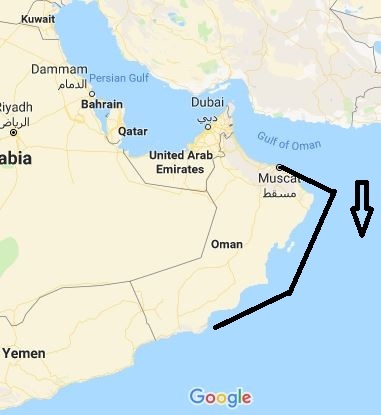 Oman is a fairly large country hence we have to travel 600 miles to the southern end. From here we sail to Salalah, also in Oman and about 600 miles to the South. The distance is too far to cover in one night so we will have a nice sunny day at sea tomorrow. No change in temperature and no change in the sunshine. Today the weather forecast promised to be partly cloudy but that was only during sunrise and sunset. As soon as the sun was high in the sky it started to burn down on the port and the ship. Luckily the ship has excellent air-conditioning and thus what was outside, stayed outside. 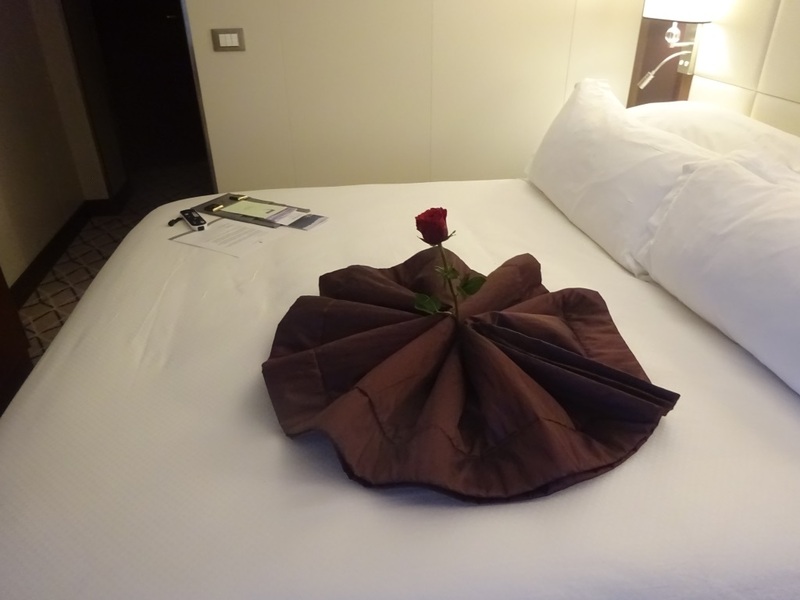 Seabourn does not do towel animals in the cabins but the stewardesses do creative things. This is the bed runner by day; now turned into a gigantic flower with a rose in the middle. I enjoy your daily port adventures and stories of days past. Thank you for all you do. Today’s posting including the story of your thwarted efforts to try and buy one of ‘those black lady dresses’ had me smiling and yes, laughing out loud. For one thing, it’s a funny story. And secondly, I could just hear you tell the story with your familiar Dutch accent. Please accept the compliment that you remind me of my father’s brother, still in Holland, who loved to entertain me with various stories told to me in English with his Dutch accent. We heard you speak a few times aboard the Nieuw Statendam’s transatlantic voyage in December. Those were quite the talks, so thorough and entertaining! We enjoy your blogs and try to read them daily. As the daughter of Dutch emigrant parents who moved to Canada in ’52 and did over 35 cruises, I can now call myself a second generation HAL cruiser.